If your claim is that it is an arbitrary choice though, how do you argue that your, personal choice should be forced on others against their will? And why should it be your personal arbitrary choice and not theirs, or mine, or some random guy from the phonebook? Once you accept that that is the principle for your justification, the argument seems to lose all force. It certainly loses it's status as an argument. It now is just an opinion, or a matter of taste. Sharmak thinks it should be X. Ok, great, but that isn't an argument. It's not my personal choice - I am just adopting ideas that other people, who have thought about this more than me, have decided is a good idea. Versus academics and corporations who appear to gain by keeping the status quo. It's a conclusion that every economy tries and they each come up with their own number after doing their own analysis. And each government, presumably elected by the people, will determine the best choice to make on the matter. Sounds good enough to me. Well they make legislation, generally in this context laws refer to how people self-organize. But we don't need to go down that rabbit hole. I'm not sure where you got the idea from my last response that I was surprised that governments pass legislation. My response was two fold: a) the use of resources for how we define society is incomplete for how that concept is generally understood and b) that even if we accept that definition, businesses pay back all resources they take in, so the argument that the don't pay back their "fair share" seems to fail. Profit is included in that latter concept. Profit isn't kept, however, in a box buried underground, it is returned to the owners. Who are, by your definition, part of society. Thus all resources taken in by the company are returned via wages, or procurement, or other costs, or profits to the society they operate in. So given that, how are they not returning their fair share? 100% would seem to be a pretty good share. Ah - but profit is what we're discussing though. Why should the owners take a lion's share of said profits whilst having the government supplement the poor wages they're paying? I don't begrudge owners profiting obviously, but if they do so by taking advantage of their own workers and then the taxpayers (which in some cases, they aren't)? Generally, yes that is the case. This is a well known concept within economics and should be relatively intuitive if explained. Automation generally has a cost associated with it, a large initial investment and an on going service and maintenance cost. Likewise, retaining labor has a stream of ongoing costs (wages, training, government compliance costs, etc). If the Net Present Value of the former is lower than the net present value of the latter, a company will invest in automation. IE, if it costs less to buy and maintain a machine to do a job, companies will do it. No one really argues that point. The question you are raising is, does minimum wage alter that equilibrium? Given that not all jobs currently capable of being automated are, in fact, automated, we can agree that there is evidence that companies are considering cost and not just moving to automation because its automated. If you were to change one of the calculations above, in this case the cost of labor long term, that would (at the margin) change whether it is profitable to automate, right? That is all I'm pointing out here, that if you raise the costs of labor, some portion of the labor force will be automated where it is profitable to do so. For empirical evidence that this does, in fact, happen see below. And that's what McDonalds tried to do but it's generally a failure because having people around is still good for business and there are many things to do with the service industry that can't really be automated. That said, automation is a huge win *no matter* the labor cost because it allows many other automation processes such as what Starbucks is doing. So I don't think they're directly correlated in the way that you're suggesting. Plus, the fact that a lot of companies don't even know how to automate should be taken into account. I will read them at some point - I don't doubt that those are legitimate reasons for automation, whether driven by MW or not. We're in a modern age where automation is inevitable regardless of MW - it all just makes sense and no doubt many jobs may disappear due to this. But I still don't see this as a reason not to pay a living wage and having the taxpayer foot the rest of the bill. The point that I was making above though is that by imposing those rules, you are also imposing unintended consequences. There are no solutions in life, only trade-offs. The government imposing a law to raise the minimum wage has a lot of unintended consequences. In this case, and from the evidence, consequences that outweigh the benefits. So the question is, if we are going to impose ourselves into the decisions made by individuals, are we going to make the world a net better place. It isn't clear at all that that is what is happening, and it isn't a good idea to impose negative consequences on people with the "we'll fix it later" mantra, because the fix also has negative consequences. Unless we can, at least, do a due dilligence on what those consequences are, it isn't the responsible thing to do to impose a policy that hurts those who are the most vulnerable. Are they unintended consequences? Or are we learning how to make better legislation? And what decisions aren't made by individuals any way? As for doing better due diligence, I would still raise MW and see what loopholes need to get closed rather than try it make a super complicated set of regulations happen in one fell swoop. The latter probably won't get passed - it's more realistic to make changes incrementally. Housing is a market like any other. Regardless, the point isn't industry specific. Let's change it to fresh vegetables, something we all agree the poor should still have access to (and by the way the largest single issue when creating the food deserts referenced by the former first lady). Let's say you are a company that provides some kind of obvious good to a community, fresh vegetables. You are currently earning $995K a year. Do you provide that next shipment of fresh vegetalbes? Your cost structure changes a lot in that case, so it likely isn't worth it to send them to that next market and make the additional $5K. Thus the community is (at least) worse off by one grocery store's access to vegetables due to this provision. Fresh vegetables aren't that great example either - I think most poor people can't even afford that - it's cheaper to buy canned veges. Which we also talked about and which we also showed that you can't absent some kind of soviet style central planning board. Even if you could freeze labor before increasing prices, some companies would be bankrupt (and therefore there would be job loses) and, probably the larger effect, new companies wouldn't start up because labor costs are too expensive. Similarly, existing companies wouldn't expand or create new jobs as often because the costs of doing so were so high. That sounds like scaremongering - no-one is asking for communism. No doubt some companies won't make it - no matter what happens there will always be some that won't be able to take on the burden. But in that case, as I've pointed out before, those companies are likely only surviving because of paying low wages and if so then good riddance! That's the rub. We can easiliy say "lets stop them from firing" but the actual implementation isn't so clean and has problems of its own. Well, so be it - companies that react badly should just be fined. That'll be easy. Corporate welfare, or advocating for corporate wellfare? The former is undoubtedly true, but is a red herring to this debate. The latter is untrue here unles you can offer me a quote of me advocating it. What is probably more relevant to this point is exactly what I was saying earlier about each intervention leading to more intervention. The reason you are offering here for the government to get involved in wage rates is because the government got involved in corporate profits earlier. It seems an odd argument to say the government is the best solution to fix a problem the government creates. Why not advocate for just stoping the underlying problem created by government? That's exactly what would happen - if workers were paid a living wage, then there'd be less of a need of corporate welfare by having a smaller safety net to run. It might not get down to zero but at least those people that are working would no longer need government assistance. Why are they not good? How do they not apply? Because the workers, the ones being helped, aren't dying. I'm not just suggesting it, I've given you the evidence that they do, in fact, cut hours due to an increase in the minimum wage. It isn't a hypothetical. You are claiming that we can counter that. You haven't offered any evidence for that, much less any evidence that your solution wouldn't cause larger problems then it was trying to fix a la above. That is the fundamental difference between my argument and yours here. I am offering evidence that the effect is happening, you are appealing to an undefined solution with no details or supporting evidence. How would we force companies to not cut hours? Please be specific. Well, all you're doing is describing how companies can work around government mandates. I don't have evidence because I haven't seen the next moves possible. It's also possible that this isn't a widespread issue and some companies will pay and not doing anything; maybe if we had a Democratic government, we could punish Amazon via some other means. Ok, which would, from the company's point of view be an additional cost right? So why wouldn't the company then lay off that person? Or, specifically, not hire that person? And don't assume companies are evil here, this doesn't require them to be monsters to have a negative impact. If the cost means that the labor no longer is profitable eventually the company will have to fire them or go bankrupt. So it isn't clear at all that this, on net, helps the poor. Now, of course you will say it is better that those "unproductive" companies don't exist. Setting aside that the use of the term unproductive is meaningless here because the standard you are applying is arbitrary, the fact is, it still doesn't help the poor. They are net worse off, with lower pay, less future job opportunities, and less services and goods in their community. And it lowers the effective tax base (by decreasing profits and income which are taxed) meaning that governments have fewer resources to help the poor with. All I can say is that companies that won't pay a living wage shouldn't exist - I don't see anything wrong with that. Of course it is because all status quos are necessarily bad. We don't live in a perfect world so, by definition, the status quo is bad (not perfect). The only relevant question is, will a minimum wage increase make the world better or worse than the status quo. The evidence is unambigious that it makes it worse. So why advocate for it? Because it is the only thing that can be currently done and we take things from there. Two important points here. 1) You are arguing that popular wisdom should be adopted over the consensus of experts. Should that apply to other fields as well? 2) You stated earlier that it was arbitrary. That word, by definition, means it is your personal choice. Regardless of where you learned about the idea, you are arguing that it should be adopted. So why should your preference be imposed upon other people? You would seem to be altering your definition of "society" then, right? Are you now excluding owners from being part of society? If so, why? Why should we not consider the return owners get for their risk part of the "fair share" that companies return to society? That said, automation is a huge win *no matter* the labor cost because it allows many other automation processes such as what Starbucks is doing. So I don't think they're directly correlated in the way that you're suggesting. Plus, the fact that a lot of companies don't even know how to automate should be taken into account. So if it cost $2M to replace a job that pays $5/hour, that would be a "huge win" for the company? I'm not sure how you make the math work there. What's more, I don't know how you square that with the evidence. If this were the case. If it were true that "automation is a huge win *no matter* the labor cost" then we should never, ever see a situation where a company hasn't automated a role, correct? But we know that isn't the case so there must be something wrong with your hypothesis. The missing part of your hypothesis is the concept of ROI (return on investment). Labor can have a better ROI depending on its efficiency, cost, etc and companies consider that before making automation decisions. But I still don't see this as a reason not to pay a living wage and having the taxpayer foot the rest of the bill. Even if that means their take home pay decreases and the tax payer foots an even higher bill? You've already conceded in this thread that there are. We already know from countless examples that the MW decreases employment, reduces social mobility, increases economic inequality, reduces workplace safety, decreases standards of living for the economically vulnerable, and disproportionally impacts minority business owners. It isn't a question of "if" here, it is a question of how you justify these negative outcomes. What set of moral reasoning says that it is better for us to living with all this negative consequence? I have a sneaking suspicion that nothing I offer will be a "great example" because you don't like the outcome of the point. Let's say you are a company that provides some kind of obvious good to a community, [Sharmak's suggestion of an obvious good to the community]. You are currently earning $995K a year. Do you provide that next shipment of [Sharmak's suggestion of an obvious good to the community]? Your cost structure changes a lot in that case, so it likely isn't worth it to send them to that next market and make the additional $5K. Thus the community is (at least) worse off by one [Sharmak's suggestion of an obvious good to the community] due to this provision. Can you address the mechanism? That sounds like scaremongering - no-one is asking for communism. It isn't scare mongering at all. That was the point of the argument made earlier and even earlier in thread. You cannot account for all the of myriad unintended consequences of all the efforts you put in place to account for the unintended consequences without a full control of all aspects of economic life. It isn't scare mongering, that is a logical necessity of the statement you made. If you are going to correct each additional unintended consequence, you will need to be able to regulate that area of economic activity right? I think this statement is a bit niave. Let's say you implement a law that says that no company is allowed to fire its workers (remember calling communism scare mongering before? ), ok, what is the consequence of that. If I'm a company I don't hire new workers. I contract with individuals for hours in an independent contractor status, exempting me from the law since they aren't employees. There are literally dozens of well established techniques to avoid having to hire someone as a W2 employee. So what is the consequence of your law? Fewer W2 employees, and more independent contractors (who are taxed at a higher rate), so the people you were aiming to help have less job security, fewer benefits, and a higher tax burden. Which means...you'll need another intervention, what is it? That's exactly what would happen - if workers were paid a living wage, then there'd be less of a need of corporate welfare by having a smaller safety net to run. But we also know that the reason wages are what they are (and not higher) is because of government compliance costs. All of the backend paperwork and HR staff, and other stuff to comply with the voluminous labor regulations account for about 40% of all costs associated with labor. So again, we are trying to artificially fix a problem government already created. Why not undue the original error rather than compounding it with a never ending set of further interventions? That is completely irrelevant to the analogy though. The question isn't about dying, its about harm. Do we intervene knowning the patient will be net worse off just so that we can say we "did something?" Not can, I'm describing how companies and governments and employees do respond to the incentives you've laid before them. That is the fundamental difference, I'm talking about what happens in the real world, not what we want to happen. The most recent example we've discussed was in Seattle. Seattle has had a Democrat city council (and a left leading democrat version at that) for 40 years. It is in King County which has been a Democrat strong hold for almost as long. Democrats hold both houses in the Washington State legislature and all state wide elected offices (and have done so for more than a decade). This is about as Democrat controlled as you can get. And yet...reduced hours, lower economic growth, and increased income inequality. Maybe it isn't the party in control, its the underlying theory. Because you are focused on your anger at the companies rather than your compassion for the worker. Fine, let's say you get your wish and they don't exist. How do those additional 100K, 1M, 10M whatever workers feed themselves now? Where does the money come from to support them? 1) Current status quo, imperfect, no minimum wage. 2) New status quo, lower employment, lower take home pay, lower economic mobility, lower opportunity for minority entreprenuers, but we have enacted a policy. You are saying you prefer world 2 because we have done something. Well, I suppose it depends on the credibility of experts. In this case, for some reason, and almost universally, this is being ignored. And probably for good reason too. I take it to mean “decided by a judge or arbiter rather than by a law or statute“. Or this case, the collective elective. We absolutely should consider everything. I don’t begrudge a business owner to reap the rewards of the risks *they* take. However, explain to me how in the case of Amazon, that barely pays taxes, can justify not paying a living wage? You’re absolutely right about ROI and that’s where automation has practically unlimited ROI: it enables further automations, better integrations with other businesses and removes manually mistakes. All companies do it in on form or another already - using online ordering systems, inventory management, or just keeping the books. Computers are ubiquitous and whose complaining about all those lost accounting jobs? No-one! You justify it by putting stronger legislation in place. Well, you haven’t really provided an actual good example that applies. To your point, assuming such a good exists, then isn’t that what business is all about? This risk and the reward. Perhaps if they absorbed the extra cost for a little while, they can afford it. And if they can’t afford a modest raise then surely that means that they can’t be expected to last long anyway. Well, there’s no reward without risks! And if keeping the status quo isn’t working then something has to be done and we learn as we go along. It’s not like this is the first time we’ve tried it - we can learn. It’s still no communism but then maybe that’s the new consequence: no more employees. Or maybe we ensure that all contractors also have to be paid a living wage. That seems to be kinda high - why is that? Maybe we need better automation. We do that all the time - we cut someone open that temporarily harms then in order to heal them with further actions. Where your medical analogy breaks down is that it doesn’t give us time to figure out new things. Are you suggesting that there are NO solutions possible? I have to think that economists would work all angles, then I’d feel better that they’re not in the pocket of big business. Or not enough disincentives. I like my idea of billing companies for what taxpayers have to foot the bill for. That can’t be too hard to implement. I have investments in those companies so I’m not angry at them: they’re doing whatever they’re being allowed to do legally - and why shouldn’t they? So it’s not my *wish* at all but rather a natural consequence of companies relying on the government to pay their workers a living wage. I have saying 2 because we can iterate again and again and again. I’ve been thinking a lot about your last post, and my own responses and given we’ve been at this for a while, with no real change in either side (other than I’ve found some additional successes and you’ve proven human nature is hard to manipulate) I think the last response summarizes our sides well. I generally ignore all your economic “arguments” since they seem suspiciously one-sided for one, but worse, for me, is that they reflect a greedy side of humanity. I say “arguments” because all they boil down to are descriptions of current human behavior. I can totally see your arguments being similarly able to support oligarchies and barons and kings of the past. I can see “economic” arguments supporting slavery and likewise these days seeing arguments against because opinion has changed against those practices. So all I see is that it’s societal and corporate attitudes that have to change. I think that’s why, the world over, all governments have ended up choosing MW. Firstly, as you pointed out it’s a quick political win and secondly, they believe that humans can be better bros to each other: particularly those that feel they should be able to afford it. On the other hand, you have investors who risked their money and owners/directors who did all the coordination to create a success; but this largely ignores the actual hard work on the ground and this is made famous with the large wage gaps between managers and workers. Thus that argument holds less weight. So the economics of it largely make no sense because you’re basically making assumptions about human behavior and attitudes; both which can be limited, modified, and evolved. If it were up to me to keep things patently unjust I’d rather make changes and adjust accordingly. Maybe, somehow, we can make something like a Universal Wage work (even though it hasn’t yet). Maybe there are new ideas we haven’t explored. I understand that you’re a conservative, so maintaining a status quo, is the safest. But even then, this status quo is also illusory - we tried allowing corporations to pay what they *feel* is “fair” and ended up having to create a massive infrastructure to provide the safety net to support that idea. And that “status quo”, which is really a few decades of expensive fixes for everyone, has largely, as you pointed out, just made the corporations lives even more difficult with 40% of labor-costs going to administrative tasks! Maybe that money can be better spent. Surely then, it’s “fair” to consider another path - one where a corporation shall pay a living wage and reduce the burden on society as a whole as well as reducing administrative costs. I think the current status quo isn’t working - it’s too bureaucratic and burdensome and government-heavy and workers still are poor. I’d rather money went directly to the workers than to maintain a system. And that means changing the minds of companies to consider fairly paying that living wage. So, current status quo which no-one likes, versus a potentially much better one, perhaps with way along the way? I’m all for the latter! Last edited by SharmaK; March 24th, 2019 at 04:52 AM. Fast-food giant McDonald's boosted congressional Democrats' efforts to hike the minimum wage Tuesday by telling the National Restaurant Association that it will no longer participate in lobby efforts against minimum-wage hikes at the federal, state or local level. "We believe increases should be phased in and that all industries should be treated the same way," Genna Gent, McDonald's vice president of government relations, wrote in the letter. "The conversation about wages is an important one; it’s one we wish to advance, not impede." If it’s going to be done, it’s going to need to be paired with relief for small businesses,” Neil Bradley, the chamber’s executive vice president and chief policy officer, told POLITICO in January. Bradley added then that the Chamber wouldn't support a raise all the way to $15 an hour. “Ultimately, progress must come from all corners of our society," Gent wrote, "and McDonald’s Corporation is committed to playing a meaningful role in the spaces we occupy." Note also that provisions are made for small businesses showing further that there is a lot of wiggle room such that we can avoid the “communist” scare that your pushing. It is clear that maintaining the status quo is becoming an undesirable position for more people and even more businesses. I’ve been thinking a lot about your last post, and my own responses and given we’ve been at this for a while, with no real change in either side (other than I’ve found some additional successes and you’ve proven human nature is hard to manipulate) I think the last response summarizes our sides wel.. If it were up to me to keep things patently unjust I’d rather make changes and adjust accordingly… Maybe there are new ideas we haven’t explored. …we tried allowing corporations to pay what they *feel* is “fair” and ended up having to create a massive infrastructure to provide the safety net to support that idea. So because this is a policy that hurts real people, let's see what we are talking about on the personal level. What you are saying is, it is totally fine that Steve Terrell is poorer now than he was six months ago, that his standard of living has decreased, that his son will be less likely to find a job and more likely to be poor. All of that is fine because we could, maybe enact a further policy to undue that? Even though you've offered no idea what that policy would be, and the ones you have offered have only made the problem worse? Really, following the tack you've taken here, that is the fundamental point you are making. It doesn't matter what the policy actually does, we can hope for a better future. Am I wrong? In this case, for some reason, and almost universally, this is being ignored. Would you apply the same reasoning to Climate Change? IE, are you arguing that we should reject climate change as a phenomenon because the political classes tend to ignore it when developing policy? I take it to mean “decided by a judge or arbiter rather than by a law or statute“. That is the definition used when referring to a legal arbitration, not a personal position. In this case, that word clearly means, "based on random choice or personal whim, rather than any reason or system." So the question remains. Why should your preference be imposed upon other people? Or if you want to appeal to popularity, why does the majority's preference reflect on the choice of individuals here? I'll grant you it was a fun red herring. But red herring it is none the less. Amazon's ability to manipulate the tax incentives offered by Congress isn't relevant. Well, maybe slightly in that you want to trust the same body that developed the byzantine tax code that allows Amazon to pay virtually no taxes to also determine what a "fair" wage is (I'm not sure why you would trust them in the one case, but not the other). Even Amazon pays everything it takes in in revenue back to "society" as you defined it. So how are they not paying their fair share by your definition? And to forestall the rabbit hole, do you really mean that you don't like the distribution of who in society it is paid to? A McDonald's ordering kiosk does not create further automation. So I don’t think you are correct that the ROI for automation is “practically unlimited.” At very least this indicates that you aren’t accounting for the time value of money in your ROI calculation. More importantly, I don’t think you addressed the central point of this response. How do you square your view with objective reality? If automation had “unlimited ROI” then why wouldn’t virtually every dollar invested by firms be in automation? Why hasn’t every single labor role that can be automated, been automated? Why are there companies still hiring people? Again, the problem with your response is that you are assuming that automation is just a natural thing, rather than an investment decision made by a company. And returning to the point of this. If you are going to make one resource more unattractive, cost wise, you shouldn’t be surprised to see a rise in the use of the other. If we put a 500% tax on automation machines, we should expect to see labor use rise, for example. What kind of legislation exactly? You seem to be implying here that there is a legislative arrangement that would make companies more profitable (so they wouldn’t have to lay off people or cut hours as wage rates rise). That seems pretty intuitively incorrect though. Do we really think legislatures are better understanding of business than those actually running the business? I’m not sure this response makes sense. How does putting “stronger legislation” in place justify decreasing employment, reducing social mobility, increasing economic inequality, reducing workplace safety, decreasing standards of living for the economically vulnerable, and disproportionally impacting minority business owners? What legislation specifically would justify those negative outcomes? I asked if you had one, the fact that you can’t offer one seems to justify my suspicion that you are simply objecting to them as a matter of form. Further justifying that suspicion is that the nature of the product is completely irrelevant to the example. Your last two sentences don’t relate to my question. So perhaps we can try again. Do you agree that the provision you suggested results in the the community being (at least) worse off by one [Sharmak's suggestion of an obvious good to the community] due to this provision? Or maybe we ensure that all contractors also have to be paid a living wage. Which, de facto concedes my main point. You can’t implement this kind of strategy without it being a continuous set of new interventions, ever expanding the scope in an effort to suspend basic laws. Let’s pretend that was step 2 of MW legislation. We expand it to contractors. Setting aside how the accounting of that is virtually impossible (since you aren’t paying a contractor a wage, but rather a fee), let’s look at the repercussions of that. We can, for the first impact, simply note that the same effects that occurred for low wage workers will also happen to them as individual contractors. Now that you’ve insisted on increasing the cost of labor in this arrangement, it doesn’t mean the business will magically keep the role and not decrease hours and fire some workers. You applying a price floor doesn’t make money magically appear to pay for that labor, regardless of its contractual arrangement. The second major impact is that you’ve now expanded the scope of your price controls, so the impact, likewise, expands. In a whole new area you would see similar decreases in job expansion, decreases in hours worked, and accompanying changes in individuals’ prospects for future career growth. And, not too unsurprisingly, this would happen to individuals I don’t think you intended to affect. It is not uncommon for senior software developers to take a low paying contract role to provide assistance to juniors as a mentor or to provide insight on the structure of a system they developed after they’ve moved on. This rule would essentially end that source of additional income for them. Even more problematic, this is very, very common in the non-profit world where a non-profit can’t afford to pay industry salaries, but people are willing to take low pay contract roles (that allow them to keep their main job) in order to help and defray some expenses. Say what you will, but your legislation will also decrease the availability of those who are highly skilled to help non-profits. So now that we’ve had these impacts, with fewer workers employed, lower tax bases, lower job security, fewer non-profits able to lend a hand, etc. we’ll need another intervention right? So what is it? You’ve never worked in an HR department or directly hired someone have you? I think most people are surprised when the find out exactly how much compliance work goes into hiring an employee. You need to register them with nearly a dozen organizations with a dozen different forms (IRS, EEOC, Immigration, SEC for most companies even private ones, industry specific bureaus, department of justice, HHS, Interior, Treasury, Commerce, SSA, etc.). You often have to file additional, periodic paperwork and conduct surveillance on activities to comply with any of a dozen law frameworks related to money laundering, provision of adequate benefits, ADA, banking regulations (including the need to file a stupidly long form about how you wages aren’t a part of money lauding or shouldn’t trigger automatic review under that act). It isn’t necessarily about automation, a lot of these forms are done digitally. It is about the sheer volume of paperwork required because of the sheer volume of regulations that govern labor. Even under your MW provision, you are imparting a small amount of cost that is coming out of what would have been available for labor pay since the company will have to report the position and wage under surveillance laws to the State or Federal government. If we really want to increase the wages people make, we need to seriously consider cutting some of the 40% of costs associated with compliance. That at least, frees up money to actually pay people. We do that all the time - we cut someone open that temporarily harms then in order to heal them with further actions. But again, that isn’t what the analogy said, you are inserting the mythical “so we can heal them later” argument when you haven’t demonstrated yet how that would happen. For the analogy to fit your position, it needs to be something like performing a surgery we know will make the person less well with an undefined hope that we will do some additional surgery later that will help him. No doctor in the world would allow that, and if they did they would go to jail or at least lose their license to practice. And it wouldn’t be unreasonable for a patient to ask the doctor, what is that second follow on step before consenting to the first surgery. Let me start with a serious question. Do you really think that economists are in the pocket of big business? Or is that just kinda a line for debate purposes? No worries if the latter, I just want to understand your actual belief on that one. Second, I’m not saying there are no tradeoffs we can make that will make people’s lives better. For example, I just offered one earlier. I’m saying that we know from a whole large set of experiences and data that externally imposing a rule on an economy almost always creates more harm than good. We know, beyond any reasonable doubt, that this rule specifically causes a lot of harm. So I think it is at least reasonable for proponents of that action to lay out how they would mitigate that harm before we start inserting our will onto individual relationships. Ok, how would you implement it? So it’s not my *wish* at all but rather a natural consequence of companies relying on the government to pay their workers a living wage. You dodged the question. How do those additional 100K, 1M, 10M whatever workers feed themselves now? Where does the money come from to support them? Well, big businesses such as Wal Mart coming into towns and shutting down those same small local businesses will do the same thing: are we to defend these businesses no matter what? I wanted to readdress this point because I stumbled upon an interesting study the other day. 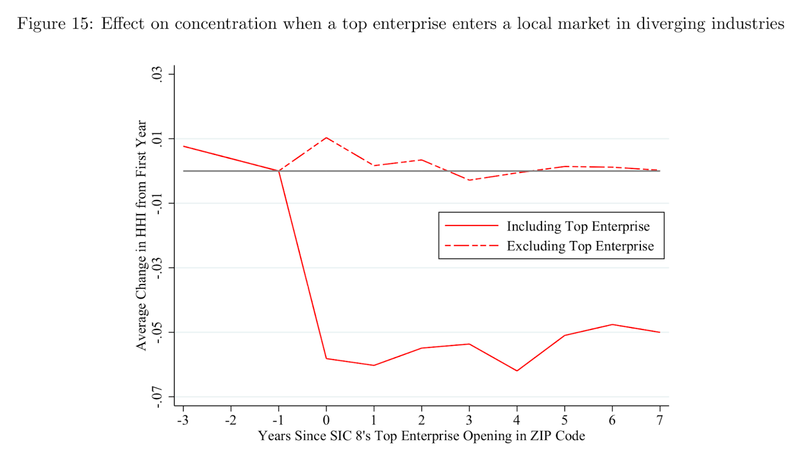 In it we see that business concentration doesn’t increase when Walmart enters a town, it decreases. IE, when Walmart enters (similar to how I responded in my last take at this) it frees up a lot of capital to pursue new economic activity (starting new businesses). So we see that Walmart doesn’t actually close down all the old mom and pop businesses in an community, it spurs the creation of new mom and pop industries in a community. Well, they look at what happens when Wal-Mart comes to town. I moved this part of the response up to the top because it does seem to be the bottom line of what we are discussing. The question is, do we make policy decisions based on experts in a field and historical evidence or ill-defined hope? Are you sure that’s what is happening? Seems to me that McDonalds is showing corporate behavior can change, small businesses can still be protected and that your evidence is merely one of many possible reactions. Well, I can only say let’s follow the McDonald’s story and see what happens. Unless it’s proven to be impossible for a better future then a short term hit that will benefit more people in the long term is worth it. Particularly if we can get corporations onboard and more people believing in their countrymen. $7 is just ridiculous. Given that it’s not ALL the political classes but only the one side that disbelieves climate change is worth dealing with, whilst continuing to pay people poorly, I think you’re overstating your case once again: it’s not the whole political classes is it? Politicians are always reflecting the majority, in theory. I really don’t see the problem here: MW is clearly about the *idea* of building a better world. If it’s a matter of my personal preference that businesses can take less profit whilst paying their workers such that the taxpayer doesn’t have the burden of supplementing awful wages, then so be it. If there’s money to be distributed and it’s not going to workers who in turn depend on the taxpayer then, yes, I don’t “like” it! What’s to like? Automation opens up opportunities for remote ordering, pre-ordering, better planning by the consumer thus leading to more efficient running of the business. It provides better metrics and better realtime statistics. The possibilities for integrations and collaborations with other digital partners and incentives that can be locally tailored and influencers that can be marshaled for other events are infinite. That stuff can only be made possible with automation. They are hiring and they are developing these ideas out. Watch this space! I don’t know why anyone would make automation more unattractive - perhaps these jobs will just have to go away. Legislatures are seeing a big bill to pay for “entitlements” whilst also seeing large companies pay few taxes, whist they report high profits. Seems to me there’s money that could be going to the workers. Well, how about my idea of billing corporations a portion of their worker’s welfare bill. That seems to me a fair way of dealing with the issue. Do you agree that the provision you suggested results in the the community being (at least) worse off by one [Sharmak's suggestion of an obvious good to the community] due to this provision? It could but it might not necessarily be the case. Or corporations will just start to play ball. Money doesn’t magically appear - it is already there in the profits that go back to the shareholders or not paid in taxes. Say what you will, but your legislation will also decrease the availability of those who are highly skilled to help non-profits. Then make an exception for non-profits! How hard is that? Or legislate more smartly and avoid the consequences we currently want to avoid. Well, let’s do that then! A combination of smart legislation that avoids known pitfalls and reduces impact on small business coupled with a culture that force corporations to pay better will avoid any of this cutting business you keep talking about. They’re just describing what has happened or what can happen, or what is likely to happen from what you’ve shown. All that we need to do now is to understand the motivations and work towards reducing harm. That’s fair too - I like that McDonalds talked about protecting small businesses, so that seems to be a good start. So long as everyone declares where they’re working and what benefits are being received, that doesn’t seem like rocket science. The excess profits from the corporations that aren’t even paying taxes.